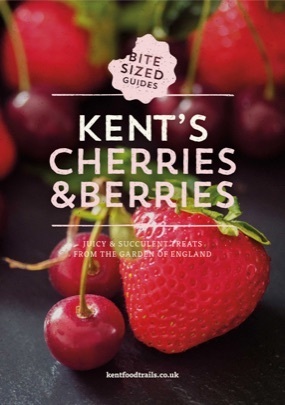 Welcome to the Garden of England, which thanks to its soils, climate and weather provides the lion’s share of all English cherries and is renowned for the very finest of fruits, the very sweetest of flavours and the very richest and deepest of colours. So let’s say hello to the stars of this garden; vibrant ripe cherries, both dreamily sweet and startlingly sour, stunning strawberries, ruby raspberries, fleshy plums, sparkling redcurrants, intense blackcurrants and rich blackberries. All these and more enjoy a fruitful home right here in Kent. It’s simply a soft fruit nirvana, filled with abundant orchards, the pink and white blossoms in spring, the array of colours, textures and tastes from the glut of fruit in the warm summer and autumn months and no shortage of places to sample them for yourself. We want to inspire you with the amazing food and drink of Kent. From products grown here for hundreds of years to 21st century innovations, food and drink has shaped the landscape of our wonderful county and we hope you enjoy exploring all it has to offer. This series of guides will introduce you to a whole range of fabulous food and drink from the Garden of England. Enjoy!